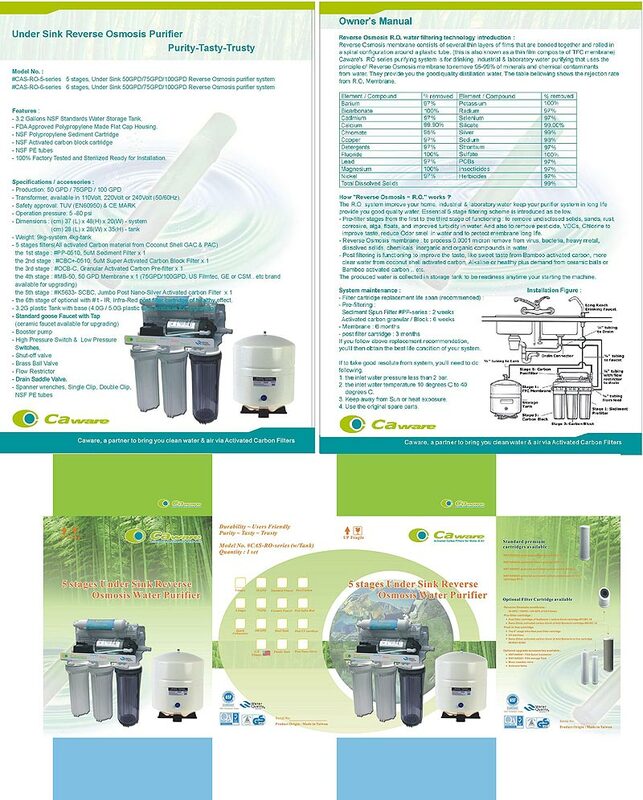 Caware International Co., Ltd. is a highly-qualified, Taiwan-based supplier and manufacturer of water purifiers, reverse osmosis filter products, and filter cartridges. This supplier has been recognized as one of the professional manufacturers in the industry since 2005. With both experience and innovation, Caware International is confident of providing buyers with quality Water Purifiers. Water purifiersproduced by Caware International Co., Ltd. can successfully remove undesired chemical and biological contaminants from water. Caware's filtering products are designed to produce clean water for various purposes including drinking, medically safe, and pure H2O for industrial applications. As one of the leading Water Purifiers manufacturers, Caware International Co., Ltd. is committed to bring the highest quality of products to customers around the world. Manufactured by Caware, our water purifiers have booster pumps with regular/ high flow and can be wall mounted or stand alone. What are more, additional accessories for Caware products such as ceramic faucet, quick connectors, electric-magnetic solenoid valve, and plastic tanks are all NSF certificated or in compliance with FDA regulations. With rich experience in manufacturing high standard poridcts, Caware has won a good reputation in the industry. Hence, if you have any question about our products, please feel free to contact our customer service representatives for further information on our water purifiers. Production capacity available with 35 GPD, 50 GPD, 75GPD, 100 GPD. US Filmtec, GE CSM or Taiwan (US DOW Filmtec origin film) membrane available. Durable Booster Pump of regular flow, or high flow output power (of compact design) available. Bracket design available with wall mounting or standing frame. Upgrade accessories available for varies ceramic faucet, quick connectors, Electric-Magnetic solenoid valve, Plastic Tanks of all NSF certificated or compliance with FDA regulations. Caware branding package or OEM customization package available with White box / Color Box and whole system labeling scheme. Optional premium full range NSF42/NSF61 filter cartridges of pre-filter and post filter cartridges to enhance and lengthen membrane life span and RO system reliability of the water purifiers. PP-10: OD 2 1/2", L10", 0.5uM, 1uM, 5uM, 10uM or 25uM pre-filter cartridge and sediment particle removal filter cartridge. CBC-10: OD 2 1/2", L10", 5uM or 10uM carbon block for chlorine, VOCs, hazardous chemical removal. CBC+-10: OD 2 3/4", L10", Super blend formula carbon block with Chloramines, E.Coli, Chloroform, Fluoride, Iron, Heavy metal removal. various function demand available for options. SCBC-10: OD 2 1/2", L10", 1uM, Nano-silver anti-bacteria resistance carbon block filter. 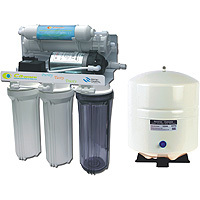 PCBC-10: OD 2 1/2", L10", Dual filter, Spun filter + carbon block, for Particle chlorine, VOCs, hazardous chemical removal. # t - B: 9 1/2"L x 2"OD, 1/4" NPT, granular Bamboo activated carbon post in line filter cartridge (in Green housing), with functions of Sweet Taste, Infra-Red for healthy plus, ceramic balls for Alkaline plus. #UV - U.V. sterilizer 1GPM, or 2GPM. etc.